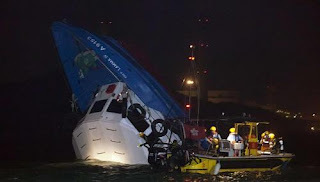 HONG KONG (AFP) - Twenty-five people were killed and dozens injured when two passenger boats collided and one sunk off Hong Kong on late Monday, officials said. The passengers of the stricken boat had been on their way to watch a huge fireworks display in Hong Kong harbour when their boat collided with another ferry, filling with water and quickly sinking, fire service officials said. 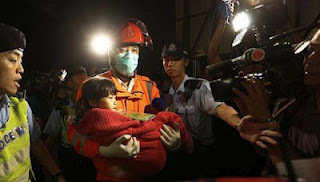 More than 120 passengers and crew were on the boat, which went down off Lamma island, some 3km from Hong Kong island, sparking a major rescue operation. “A vessel collision incident involving two passenger vessels occurred at the seafront of Lamma Island last night,” a Fire Services Department (FSD) statement said. “(The) Fire Services Department received the call at 8.23pm (8.23pm Singapore time) and arrived at scene at 8.41pm. As at 3am today FSD has rescued 123 passengers from the sinking vessel. Among them, 17 were certified dead at scene while eight others were certified dead upon arrival at hospitals. The FSD said the rescue operation was hampered by darkness and “many obstacles onboard”. “Rescue action will continue overnight as FSD cannot rule out that there are still people inside the vessel or missing,” the statement said. A Hospital Authority spokesman earlier said eight people had been killed in the collision. 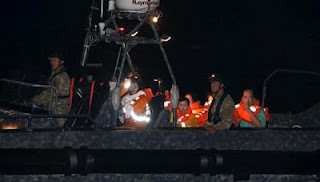 Rescue teams in boats and helicopters spent the night scouring the sea around the site of the accident for signs of survivors, while dive teams entered the sunken boat. Survivors were taken by boat to Hong Kong island, where a fleet of ambulances whisked them to several hospitals.